All it took was a dash of Pepper ! Last Sunday my daughter brought home a 35- day- old pup…. An event I’d tried to fight off for over ten years. It is not like I don’t like dogs… just, I’ve never seen myself as a dog owner. After bringing up two kids, making some compromises on my lifestyle, my career, I just wasn’t ready to take on a responsibility that I could clearly see was for ever—dogs never can become self sufficient. Deep down there was another fear. Years ago, I’d seen a dog bite my sister. Much later, a pup my husband and two year old son played with died, and I witnessed both of them taking 14 shots in the stomach. As far as I was concerned, dogs and I didn’t belong. Years of arguments later, my resistance was beaten down with my daughter proclaiming she would look after him totally. At some level I felt guilty denying them what my husband declared was an experience of a lifetime. I made a mental resolve to disengage. It was their decision, their responsibility. But how does one disengage from a small defenseless creature peering out from the folds of a soft towel? Last Sunday, when I first saw Sgt Pepper ( a name he doesn’t respond to just yet) I felt guilty… of not giving him a fair chance. He whined piteously the first night. All members of the family were up and watching… a thing that hadn’t happened in years. We all lead pretty independent lives, sometimes we are like ships that pass in the night. Yet with one small whine four anxious heads gathered around the basin simultaneously making diverse sounds. Our latest addition had succeeded where I’d failed for years…getting all of us together… a thing we didn’t do even at mealtimes given our schedules. Day two brought a stream of visitors… friends of my daughter all of whom had suggestions on every aspect of bringing up a dog. Suddenly I realized I’d been catapulted into a vast network of dog lovers. My social life is changing. In the last week most of the calls have been about Sgt Pepper. One visitor brings brownies on each visit for us… love your dog, and we love you too! Meanwhile Pepper is literally growing by leaps and bounds. Each day he explores a new part of the home. I am beginning to understand that the world offers a whole new perspective five inches from the ground…there are no obstacles to a small furry body that can get through anything. 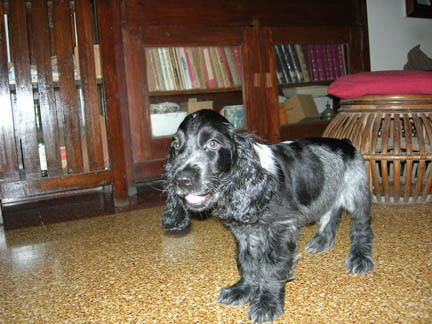 I am learning from a forty- day- old pup the meaning of risk taking! He knows how to get attention and keep it riveted on him … another area I’d like tips on! My need for tidiness also seems to be on a decline with newspapers, toys chewables strewn all over the place. I actually don’t feel the need to clean up immediately. One week ago I would not have believed that I’d be doing things so differently. Maybe we can learn people management skills from a puppy! !